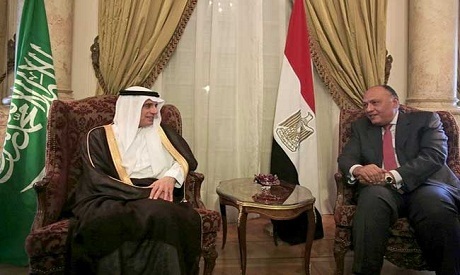 Egypt's Foreign Minister Sameh Shoukry discussed Friday, among other issues, developments on the Grand Ethiopian Renaissance Dam (GERD) with his Saudi counterpart, Foreign Minister Adel Al-Jubeir, the Egyptian foreign ministry announced. According to a statement issued by the foreign ministry, the two top diplomats met on the sidelines of the Euro-Mediterranean Dialogue held in Rome. Shoukry and Al-Jubeir discussed the latest developments in the region, especially in Syria, Lebanon, Yemen, Libya and the Qatar crisis. Shoukry also discussed Egyptian efforts in achieving Palestinian reconciliation and how to enable the national accord government to do its job in the Gaza Strip, as well as reviving the Palestinian-Israeli peace process. For his part, Al-Jubeir presented his condolences to Egypt for Al-Rawda Mosque terrorist attack where not less 310 were killed last week in North Sinai.